I'm Canadian, and my mom was traveling the UK. I'd asked her to pick up the 12" for West End Girls, as it was new in North America, and I couldn't find the 12" to buy. So she goes into the HMV, and the clerk says this record just came out, has the song on it, and it's autographed! So she bought this instead. I've actually never played it. But does this story make sense, did they pre sign a lot of the Please records to distribute through HMV? Thanks for any info. And is the autograph real? Don’t know how it came to be signed, maybe they signed a few copies for promotion, but those signatures are 100% genuine!! It's true. 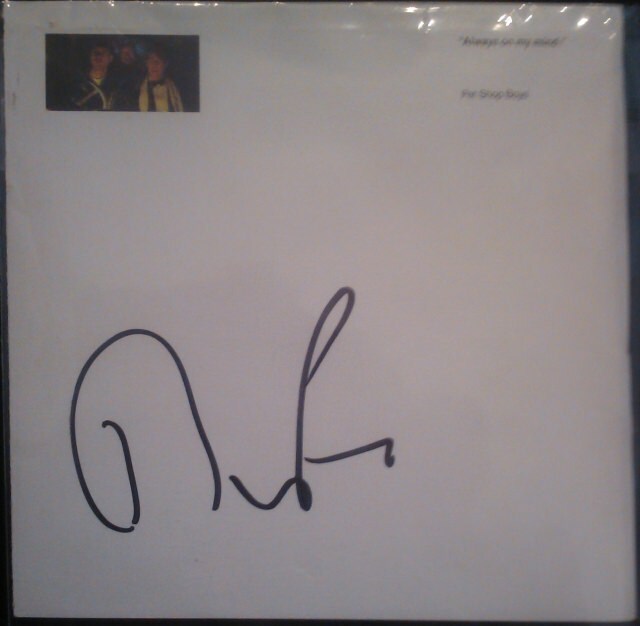 I bought my signed copy of Please at HMV, 150 Oxford Street, the week it was released. The EMI / Parlophone offices were around the corner in Manchester Square and PSB signed a few copies for sale in the shop. Happy days! could the experts give an opinion if this is a fake? Here is the only autographed item I have from them. to come out after the show. It is the US promo CD for 'Always on my mind'. Just wanted to put another image out there for reference. Inconclusive. It does indeed look real, but it is hard to tell if it is real or not. When you have a scribble like Neil's, it would be a lot easier to forge. Being able to look at Neil's and Chris' together makes it easier to judge. If it is for sale somewhere like ebay, you can look at things like what else does the person have for sale? Do they specialize in a lot of autographs? If they are all very cheap, that is a likelihood they are inauthentic, although a high price would tell you nothing about authenticity. If they offer other signatures for sale by others, examine some of them. Do they hold up to what to what should be, right? JSA and PSA are leaders when it comes to certs, so you could search other artists who have JSA or PSA certs. If they have a home made LOA from the ebay seller or some other outfit, that is a strong indicator to be cautious, although it doesn't necessarily mean it is fake. If it appears to be a random fan who doesn't have large amounts of autographs for sale, that would be a good sign, although it doesn't rule out a forgery. They could have obtained it from a third party who forged it. I think if it is just Neil's name, that is more of a likelihood it is real, as a forger would more likely forge both.